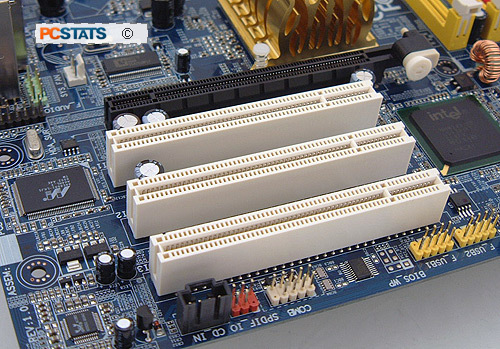 The Gigabyte GA-8I945GZME-RH motherboard supports three 32-bit PCI slots and one PCI Express x16 videocard but only in PCI Express 4 mode. The High Definition audio header for the remaining surround sound channels is just to the left of the PCI Express x16 connector, but unfortunately the necessary bracket is an optional extra in with this budget board. The white COMB port is for a secondary COM port. Again, neither USB2.0 bracket is included. The four 'click-connect' SATA II connectors positively lock each SATA cable into position, reducing the chance of loose cables down the road. The Intel ICH7 southbridge supports a single IDE channel (two IDE devices). 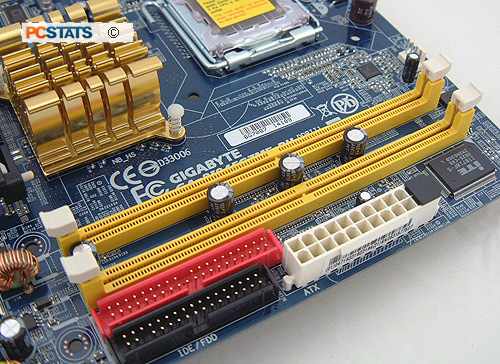 Various USB and and front panel connectors occupy this section of the Gigabyte GA-8I945GZME-RH motherboard. It's nice how Gigabyte places the lone IDE & Floppy connectors along side the main ATX power connector just to the right of the DIMM slots. The DDR-2 DIMM slots support 2GB of DDR2-533/400 RAM. 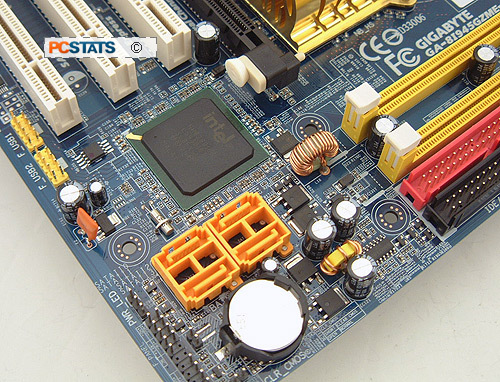 The 945GZ Express chipset is cooled with a passive aluminum heatsink. 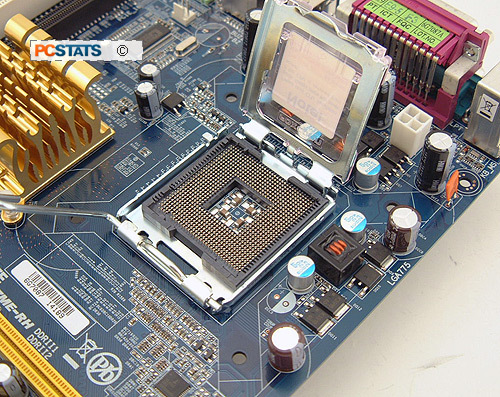 The LGA775 CPU heatsink and fan make use of a 4-pin Pulse Width Modulation (PWM) fan header that allows the motherboard BIOS to automatically scale fan speed to match heat load, so noise is kept to a minimum.